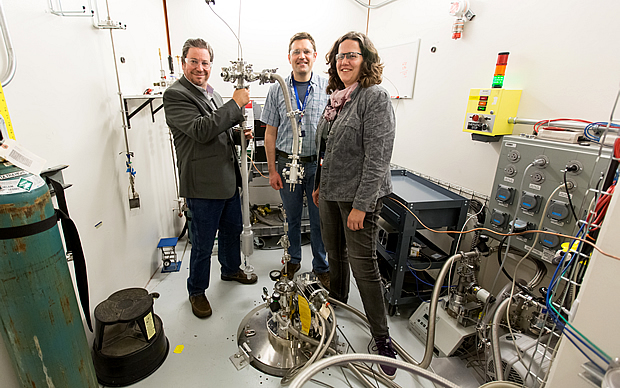 A collaboration between ESS and the Spallation Neutron Source in the US has resulted in a new piece of sample environment equipment that will benefit the users of both facilities. LUND and OAK RIDGE—A collaboration between the Spallation Neutron Source (SNS) in the US and the European Spallation Source (ESS) has resulted in a new piece of sample environment equipment that will benefit the users of both facilities. It provides the additional benefit of enabling research that will contribute to optimisation of the ESS Target moderator. Monika Hartl, a scientist in the ESS Target Division, worked with SNS to develop the new tool, a sample stick to be used with SNS’s world-leading vibrational spectrometer, VISION. The device will also be applicable for use with the ESS instrument VESPA, expected to go online in 2024. Enabling simultaneous photon and neutron measurements on the same sample, the sample stick will open up new opportunities in chemistry and energy research. The installation of the device on VISION has additionally been used to investigate the so-called ortho-para conversion of hydrogen. This research will in turn be used to optimise the ESS moderator as well as moderators planned for the second target station at SNS. The result will be more neutrons for instruments at both facilities. The following article is reprinted from neutrons.ornl.gov, the website for SNS. A new tool is available to users at VISION, Spallation Neutron Source beam line 16B, allowing simultaneous neutron and photon scattering measurements. The world’s foremost spectrometer for neutron vibrational spectroscopy, VISION, applies the inelastic scattering of neutrons to the study of molecular and intermolecular bonding. However, the ability to study a sample using multiple techniques provides more concrete results. The new tool, a sample stick, makes it possible for users to simultaneously characterize samples using both neutron scattering as well as Raman spectroscopy—the inelastic scattering of light. To ensure accuracy, there should not be a significant difference in the state or makeup of the sample before using both techniques. Thus, the sample stick eliminates guesswork by allowing users to study the same exact sample using the two spectroscopic methods simultaneously. “It can be very difficult, if not impossible, to set the sample up with the same initial conditions,” said post-doctoral researcher Chad Gillis. The development of the new sample stick was a collaborative effort with the European Spallation Source. In addition to Gillis, the team responsible includes lead scientist Erik Iverson and ESS lead for the project Monika Hartl, as well as VISION beamline scientists Luke Daemen, Yongqiang Cheng, and Anibal (Timmy) Ramirez-Cuesta. SNS neutronics scientists Franz Gallmeier and Thomas Huegle were also instrumental in developing the new capability. Neutrons are particularly sensitive to hydrogen, and the new sample stick provides a more complete analysis of this chemical element. 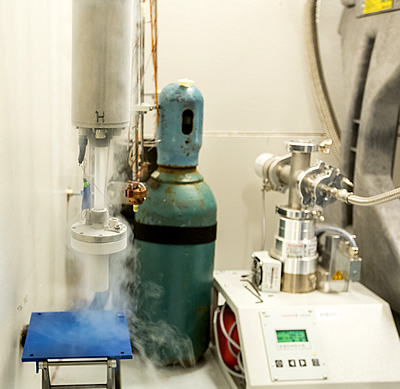 Hydrogen plays a key role in neutron moderation, which is the process of slowing fast-moving neutrons to speeds appropriate for use in scientific studies. In fact, three of the SNS’s four neutron moderators contain cryogenic liquid hydrogen. Hydrogen molecules exist in two states—parahydrogen and orthohydrogen. These states correspond to the total instrinsic angular momentum, or spin, of the two protons joining together. The two states have significantly different moderating properties and so it is essential to understand the ratio of the two states and how they coexist in any hydrogen moderator setup. “The relative proportion of these two states of the hydrogen molecules determines what we would have to do to optimize the design of the neutron moderator,” Gillis said. The sample stick will also be widely used for chemistry applications, in particular catalysis. Users can now study their samples with this tool, and instrument scientists are excited about VISION’s newly improved ability to combine neutron scattering and Raman spectroscopy into one simple step. SNS is a Department of Energy Office of Science User Facility. UT-Battelle manages ORNL for the DOE’s Office of Science. The Office of Science is the single largest supporter of basic research in the physical sciences in the United States, and is working to address some of the most pressing challenges of our time. For more information, please visit http://science.energy.gov/.